So messy rooms. It comes up all the time. And for some reason it's a real hot spot with parents. Most parents will say, how do I get my kid to clean his room? Well, you do whatever you want to, as long as you don't fracture the relationship at the same time. Because at the end of the day, I don't think very many parents who will remember what their 11 year old's room looked like when they have a 25 year old who is living their life and maintains a job and can clean their own apartment. I think what parents are really asking is how do I help teach my children about taking care of their stuff and taking care of their environment and cooperating with me when I ask them to pick it up? And that really comes down to family guidelines. Sitting down with everyone in the family and being really honest and saying, I know that your room is your room. But it drives me crazy when I walk by. And I know you don't care about the room. But is there some way for us to meet in the middle? Because truthfully that's how most of us in the adult world have to enter into work relationships. I have to give a little bit and someone else has to give a little bit. So instead of making the room something that causes a power struggle and a constant fight, sit down and say, is there a way we can come to terms with what works for you and what works for me? And in my experience, most kids, when a parent says come to the table and work this out with me, and I'll give you some latitude, and I'll listen to your suggestions, are really willing to work with their parents instead of against them. So some compromises might include that there's a path for the parent to get through from the door to the bed if the child still wants the parents to come in and read or kiss them or wake them up in the morning. A compromise might be that mom and dad are no longer doing the child's laundry. So there's a laundry basket that's issued to the child. 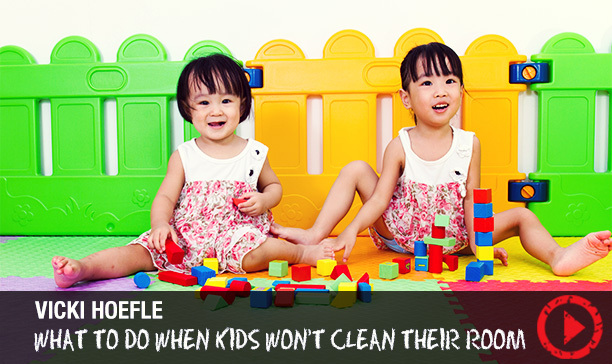 That will oftentimes take care of the tidy room mess. There might be a compromise that the child is not allowed to have a sleepover until the room is picked up to a certain extent. So it's not a bad idea to just sit down and brainstorm what are those compromises, because oftentimes you can sit down and flush out and come to something that makes both people incredibly and feel like, I think I won this, and the kid's thinking, I think I won this, which is a great way to end that. How important are chores for teaching kids responsibility? Gary A. Dordick, Esq.